Mumble is priority "Voice over IP" software that allows users to speak on a chat channel with other users, much like a telephone conference call. A Mumble user will often wear a headset with an integrated microphone. The target group for Mumble is gamers, who can use the software to communicate with other players in the same team of a multiplayer game. Communicating by voice gives a competitive advantage by allowing players to keep their hands on the controls. 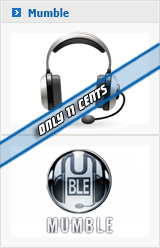 When you order one of our Mumble servers, you will get our best price of 0,11 a slot! This price is the same for private and public servers. You can control your Mumble server with the control panel and configure your server to your own needs. In addition to that we give live support for the servers. Mumble has a low latency (the time to recieve the signal) and a possibility to turn the echo off. Mumble has a coded system to guarantee the privacy of the users since the Mumble 1.1 version. All servers are inclusive of a free setup and our setup provides only the fastest bandwidth. So we always set you up with the fastest Mumble server. Because of this configuration all users of Mumble have great and stable connections.